NYX Single e/s Swatches..Quality Control anyone? NYX has generally surprised me over the years with the high quality of their shadows in combination with their low prices. 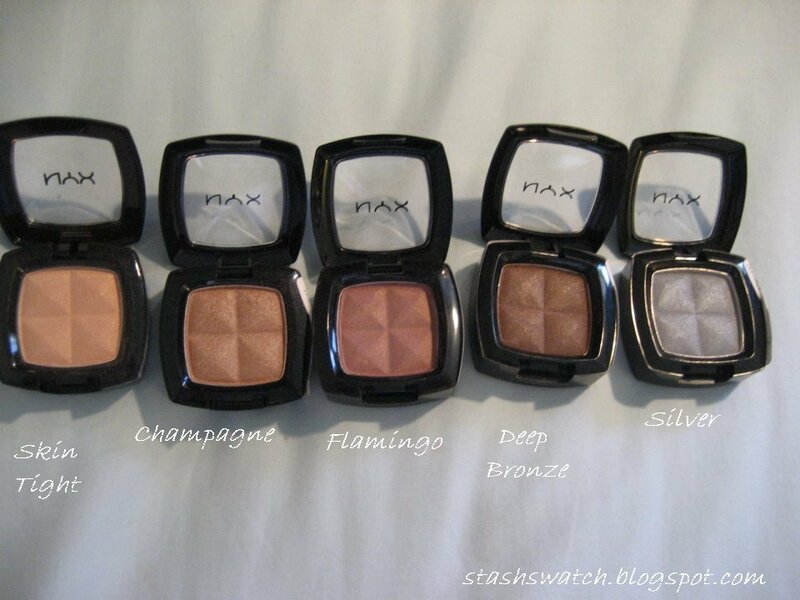 The eyeshadows, most especially the single colors, are smooth, pigmented, and blend very well. I've bought quite a few of them along the way, but these are the ones I've kept. Sparkle Cedar-a nice taupe with a lot of sparkle to it. It appears to me to have a slight hint of green to it while still remaining on the cooler side of the spectrum. 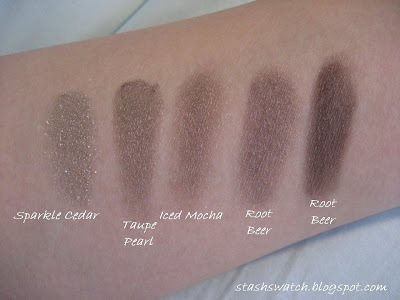 Iced Mocha- one of my oldest NYX singles; it's a bit warmer than Taupe Pearl, but the two are fairly similar. 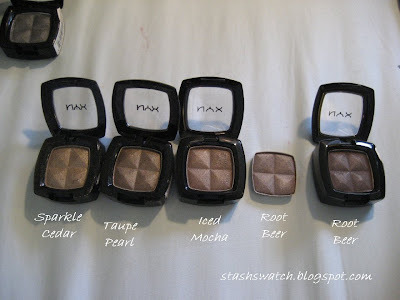 The last two swatches of this set are both NYX Root Beer-both were bought at different times from different places, but both have the same name and look very different from each other. 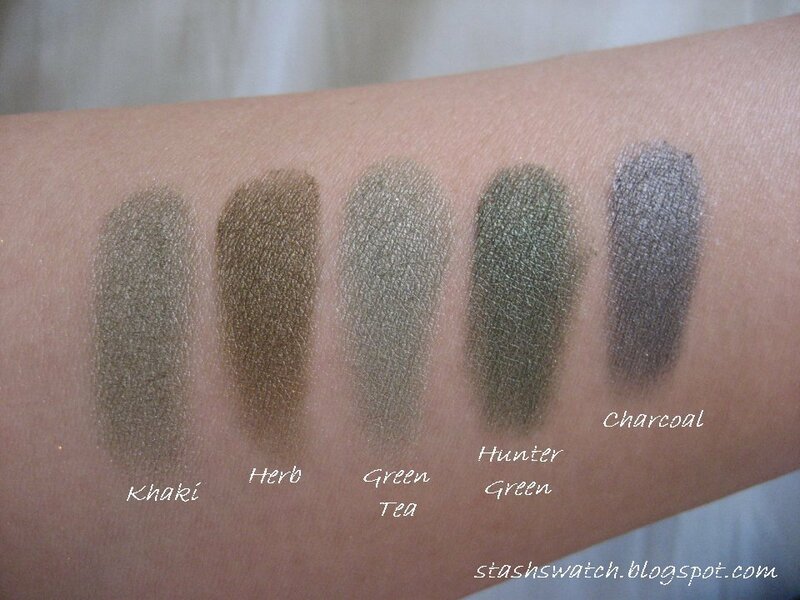 The first one, has a considerable amount more purple tones to it and is a lighter taupey color. The second is a richer brown-taupe with a hint of pruple, but it's a much less strong purple tone than the other one. I had bought the second one after depotting the first one and being left with regret. However, I discovered after coming home with it that the two colors were not identical; and therefore felt the need to keep both. Seeing the two of these next to each other, I can see why people have argued about whether or not NYX Root Beer is considered a dupe for the elusive MAC Moth Brown. (I'd say one of the versions is probably close)..which I suppose leads me to my title question; Quality Control anyone? 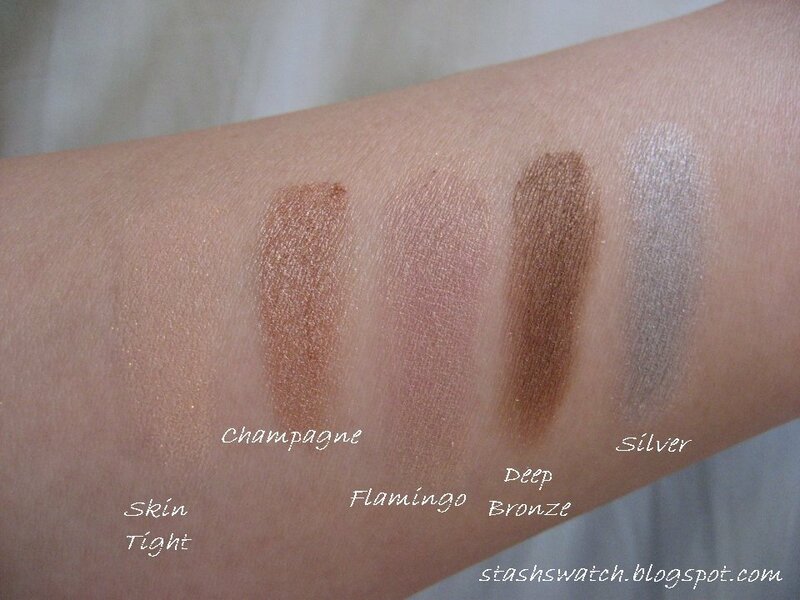 It's a bit silly to have shades that are so inconsistent among batches.. Skin Tight-a light warm peachy skintone like shade with golden peach sparkle. This is pretty without lending too much color on my eyes. Champagne-the color apples turn when they start oxidizing...only shimmery. I don't feel like Champagne is a real Champagne color, but it's still a nice color. Flamingo- a nice, dirty pink/gold duochromish shadow. 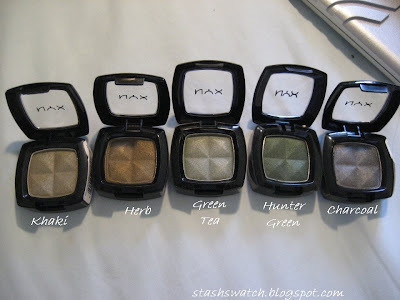 I like this shade quite a bit, but I find it harder and more difficult to work with than the rest of my NYX. Silver-a nice silver shade without too many blue tones.